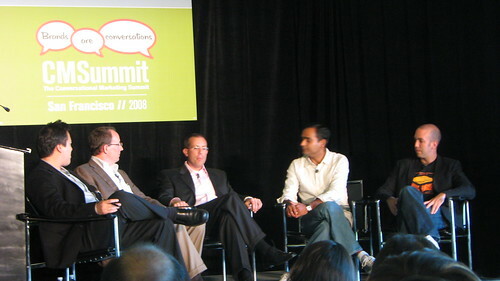 Yesterday I attended Federated Media’s Conversational Marketing Summit, held at the Presidio in San Francisco. Forrester Senior Analyst Jeremiah Owyang provides a good summary of the panel that he moderated: Social Media Measurement: Dashboards vs GPS. The conference wraps up today. Follow my Twitterstream for my comments / observations. When service was restored this evening, the [COMPANY X] chat room was flooded with comments from customers, many of whom said they were growing tired of repeated glitches. Although the disruption today was by far the worst in the company’s short history, it has had a series of smaller glitches in the last year. ”There really is no excuse for so many problems other than poor management,” remarked one [COMPANY X] customer. A few customers said they had switched to the … site run by [COMPANY Y], one of a number of companies that have begun an [xxxxx] business to capture a piece of the enormous on-line [yyyyy] that was pioneered by [COMPANY X]. But others said they would stick with [COMPANY X]. So which company are they talking about? Did you guess Twitter? No, it’s from a June 1999 New York Times article about a little company called eBay. No doubt, Twitter has had a rough couple of weeks. It’s been up and down like a yo-yo and people are frustrated. People are calling for a decentralized Twitter and some people even organized a Twit-out, which was a 24 hour boycott of the Twitter service. Even some of Twitter’s biggest supporters, like Chris Brogan, are furious. While I can understand all of these negative feelings about Twitter, I just think we need to remember that just about every popular web service has gone through this phase at some point in their history. eBay, Amazon, AOL – the list goes on. And all of those companies worked through those difficult periods and went on to become models of stability. Most people who were around during Web 1.0 will tell you that these companies did not solve these problems overnight. It took months and the progress was often two steps forward, three steps back. Oh, and remember – this is a free service! Let’s give the Twitter crew a break and save our complaining for when this is something that we’re paying for. This is a good overview of del.icio.us, my favorite social bookmarking service. You can find my del.icio.us page here.